Do you see me over here enjoying this lovely California weather? I'm wearing sandals and all!! Today's look is totally California boho and I'm super comfortable in my maxi skirt. I partnered with Alloy on this post. I've known about and shopped Alloy for years. I remember being young (like 24) and plus size and it was one of the very few sites that offered extended sizing to their plus size customers in trendier items. Back then there were only a handful of places that you could buy plus size clothing. Being a new college graduate, at the time, their pricing was friendly to my budget. Matter of fact, both the top and bottom together total under $50. Also, being on the larger side of plus in my pants sizes (even then), Alloy goes up to a size 25 (jr's sizes) in their bottoms. Make sure to check the size chart so you can gage the sizing. Can I say that I'm in love with this leopard top. Obviously, I adore the print. I feel like my wardrobe has been lacking leopard and my absolute favorite print to wear. I've been neglecting my old friend. I have to do better. I, also, love the collar. The collar is perfect for slipping a really cute necklace underneath and can almost serve as a way to add a surprise accessory to your outfit. Style Note: I got my shirt and skirt in Alloy's XXXL. Since it's juniors plus size I usually just always get the largest size and, for the most part, it works. The arm room is pretty good on the top as well. Also not that the top is slightly sheer. 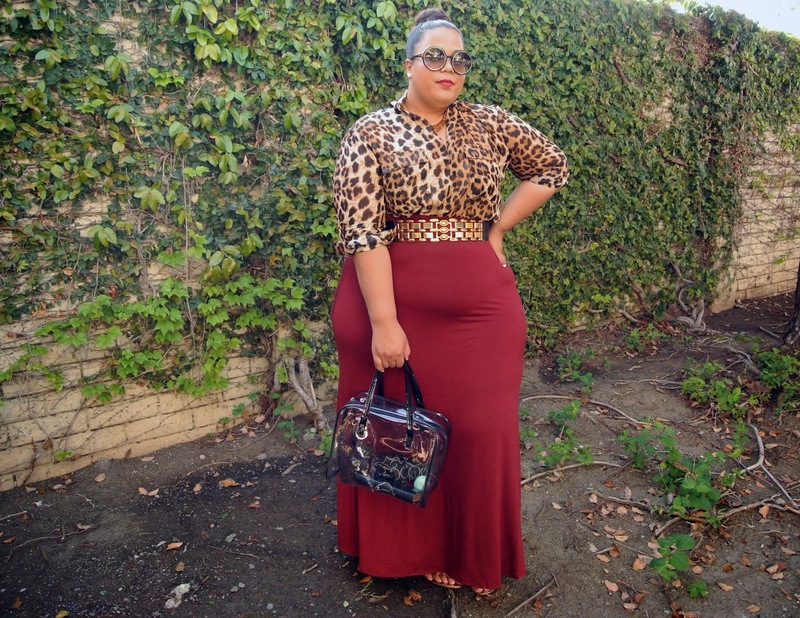 Also, I usually get asked about my shape wear and under this skirt I'm wearing capri shape wear. It's one of my favorites because it goes back the knee. You can find a similar one here. This post was sponsored by Alloy, all opinions are 100% my own. very nice outfit love it!!! Super chic! The red and leopard is gorgeous! I love the info about the arm holes, its always my worst fear, trying to squish my arms into little tops! lol! No problem...sometimes I forget to add the arm info. I know people want to know that. Very cute. Love the top! Such a chic look! I remember Alloy from middle school and high school. They were right up there with Delia's with their hip catalogs! I didn't even realize that their sizing worked for plus girls or that they had such grown-up pieces! Definitely worth checking out! I love the deep red and leopard on you by the way. I was going to wear my leopard dress later this week. I'll have to try it with my red belts and gold jewelry to see how it looks! Gold and leopard are always a great pair! omg im loving this outfit! 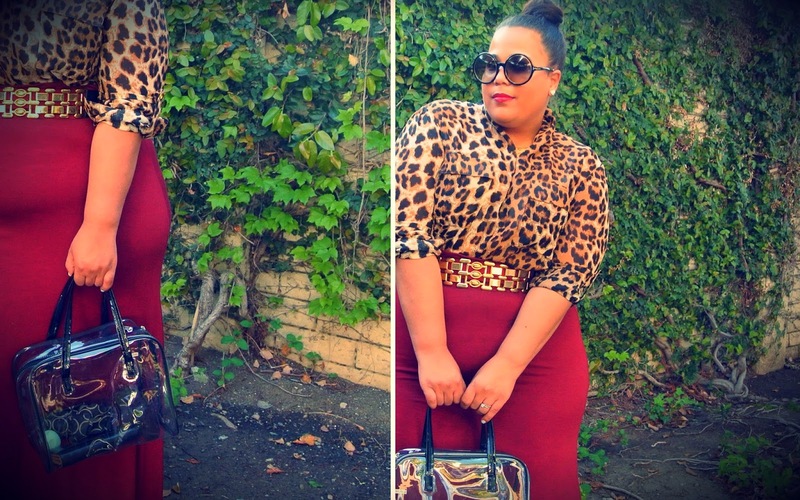 the leopard print and burgundy colored skirt is just amazing! i will have to check out their site! you look so great all the time what king of under garments do you wear (if you don't mind me asking) you are super curvy and everything sitting right. Thank you I talked about the shapewear I have on in the verbiage above. Yes, this is a def. transition print. Go for it! Chastity, I LOOOVVEEE your style. I seriously think you should be a Hollywood stylist. I just saw a mention of your blog on all places, GOMI, and everyone had much praise for you, so I came here, and I'm so impressed. This looks wonderful! 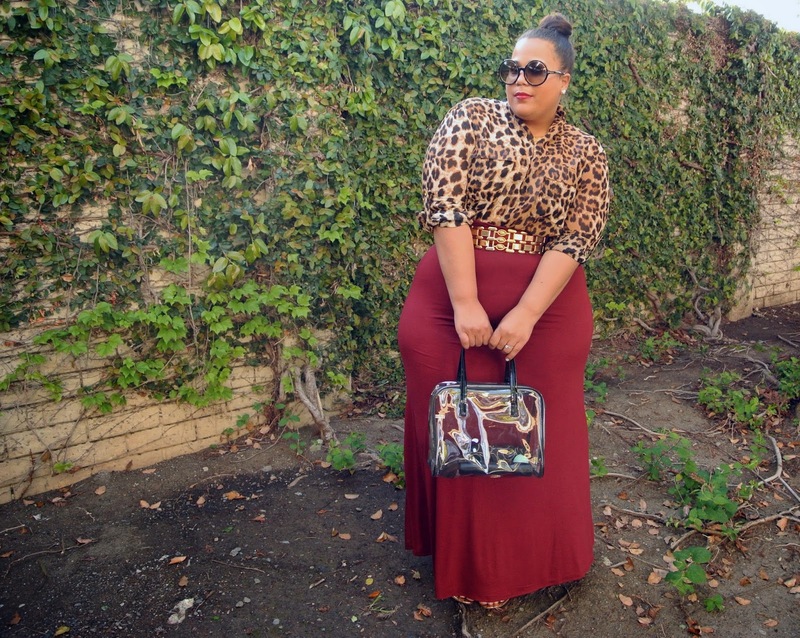 I always have a hard time with maxi skirts, so it's always nice to see a great look! Soooo you're blogger royalty and you're are going just post a comment. Just like that! #passesout LOL. Aside from that, sometimes for maxi skirt, I think the stars have to be aligned for them to work out LOL. It was great meeting you as well!!! You are pure awesomeness!! Loving this outfit and the shades are everything! Love this look!